The Ultimate Up-sell – When Is It Too Much? If you offer a multitude of products and/or services online, it’s always beneficial to up-sell or cross-sell your customer. It provides an extra benefit to the customer and it adds to the companies sales. But when is it too much? This idea hit me while on Dell.com looking at their computers. The great part about Dell is you can build, or customize your computer to exactly what you want. 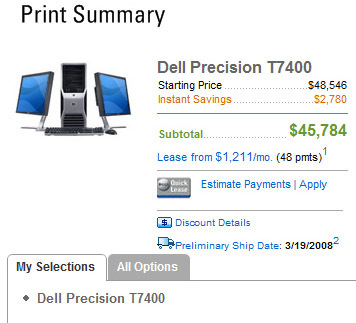 What I think is not so great about Dell is all of the up-selling they throw at you while doing so. I decided to see just how far Dell would take customizing a single computer. I wanted to select every option and the most expensive of each option. I was presented with 173 options while building a single computer. What did a $1,200 computer end up costing with all of the up-selling? $45,784! I think up-selling is a wise choice for any business that is building a shopping cart, but I think there is a cut off point when it becomes too much. When putting together an order process, you typically want to make it as quick and painless as possible and your sales will greatly increase. Too many options gives the customer too many chances of getting frustrated, confused or changing their mind. In my case, I planned on purchasing a computer and never did. How Evil Is Google Today?